Does Generic Rogaine Work? Is Generic Minoxidil As Good As Rogaine? Is generic Rogaine as effective as the brand name version? This review of generic minoxidil for women and men shines a light on whether this drug works in all its many forms (foam, liquid, and 2% vs 5% strengths). The active ingredient in Rogaine is the drug minoxidil - this is a vasodilator which means it widens (dilates) blood vessels. This explains why, during the 1960s, it was being used to treat high blood pressure (hypertension). But, in the 1970s it was discovered that this antihypertensive drug also produced some hair regrowth as a side effect. So, new trials were then carried out using minoxidil on hair loss patients instead. In the 1980s, a number of trials reported that minoxidil was capable of producing "significant hair growth". The success it appeared to show led to FDA approval for its use in the treatment of hair loss (androgenetic alopecia) and it entered the market in the late 1980s. There is some debate about this. But, given that it can dilate blood vessels, this is obviously something which could encourage blood to flow more easily to the hair roots. And it might also provide hair cells with nitric oxide (another substance that can dilate blood vessels and, therein, help hair grow). So this is most probably the mechanism behind any success minoxidil brings to hair loss patients. But it’s not a cure for hair loss! Many of the clinical trials which showed its effectiveness have been in younger men and women who had only mild hair loss and for a relatively short period of time. So, in other words, the older you are, the longer you've suffered hair loss and the more severe it is, the less likely that minoxidil will help you. And regardless of your age or anything else, this drug is only meant to be used on the crown of your head and not at the front temple region. So if you’ve got a receding hairline, it’s unlikely to grow any new hair for you in this region. Despite numerous trials showing "significant hair growth" (no doubt with many "before and after" photos to back them up), the original regular strength product (2% minoxidil) didn't work well enough for a lot of men. So a stronger (5%) product and later on, a more user-friendly foam version of it, were introduced to improve effectiveness (obviously the stronger the drug, the more chance it has of producing at least some hair regrowth). Although the official Rogaine website has now been changed since I first researched for this article, it used to have a "Product Details" tab which stated that, in placebo-controlled trials on relatively young women (18 to 45) with mild to moderate hair loss, 19% experienced moderate hair regrowth after 8 months. However, moderate regrowth was also reported by 7% of those on the placebo liquid (i.e., even though it had no therapeutic effect). This suggests that it's quite likely that 7% of the women using minoxidil might also have experienced such regrowth (i.e., regardless of using the drug). In which case, perhaps only 12% of women gained moderate hair growth as a direct result of using minoxidil (i.e., 19% minus 7%). And 12% is not a lot! The brand name Rogaine does now have a higher strength (5%) foam product for women (the liquid Rogaine for women is still 2%). Unfortunately, regardless of the product strength or the form it takes, both generic Rogaine and the brand name versions don't really work for many men and women who try it. Mild - A dry, flaky, itchy scalp. Moderate - A red rash might develop on your skin. And this is just the tip of the iceberg. For the full list, read my Rogaine side effects review. Just for the record, the brand name versions ("Men's Rogaine" and "Women's Rogaine") used to be called "Rogaine for Men" and "Rogaine for Women". The UK versions still carry the original names ("Regaine for Men" and "Regaine for Women"). Whenever a pharmaceutical company patents a new drug, they’ll get exclusive rights to market it (which is for 20 years if the patent is filed in the USA). After this time the patent expires and the market is opened up to competition (and the price should come tumbling down). So, generic minoxidil (or generic Rogaine as it's often called) is now produced by many other companies as well. And this increase in competition has meant that you can get generic Rogaine a lot cheaper than the brand name version. 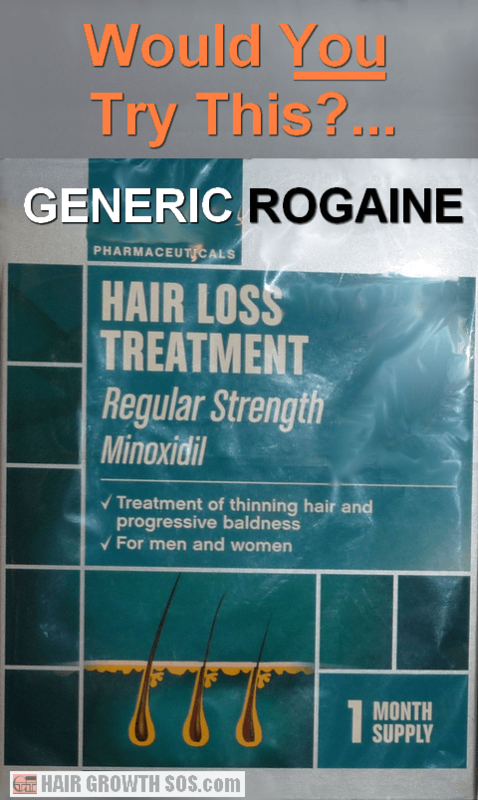 Since minoxidil is a drug with a specific chemical formula, there shouldn't really be any difference between the Rogaine brand name and generic minoxidil versions. Which, of course, should mean that they are as effective (or ineffective!) as each other. However, whilst I personally am uneasy about using minoxidl to treat hair loss, if you must use drugs, perhaps it’s best to stay on the "safer" side and use the branded version rather than generic Rogaine. That's because you'll know for sure that you're putting the pure drug onto your scalp (and at the concentration stated) from the company that has FDA approval. Anything else and you could run the risk of putting other substances into your body too – if the generic Rogaine you get hold of has impurities or extra ingredients, it might not be absorbed as well as the branded drug and so have a lesser effect. At the very least, you should thoroughly research customer reviews of the generic minoxidil version you're considering before you go ahead and try it. The branded version of Rogaine is available in both foam and liquid forms. For men, 5% strength versions are available as both foam and liquid; for women, there is now a 5% foam version available along with the original 2% strength liquid. Generic Rogaine liquid (both 2% and 5% strengths) have been around for a while. And generic Rogaine foam for men is available too. Finally, since the brand name version now has a 5% foam product for women, no doubt generic Rogaine for women will also be available in time. You do not need a prescription to get hold of either the branded or non-branded versions of all these hair loss products. The branded product range also used to include Progaine Shampoo (Pregaine in the UK) which did not contain minoxidil, but was discontinued following low levels of sales. Read previous page? Rogaine side effects.